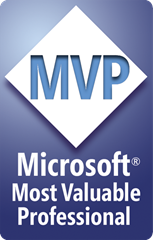 For years I’ve been a Visual C# MVP. It was always a title I was very proud of, since it meant that the work I do for the community didn’t go by unnoticed. Still, every year when renewal time came around I got more and more nervous. Would I be an MVP again this year? Today was renewal day so I was anxiously waiting for that email (or not getting it…). And just after 4 pm I got that email: congratulations, you’ve become an MVP awardee! I was very happy of course. But then I took a better look at that email. Wait a minute… I am a Surface MVP now? Oh… That’s even better! So, right now I am part of a very select group (currently, with me included, 4 people) of Microsoft Surface MVP’s. I will do my best to make sure I deserve this title by informing the community about Touch in general and Surface in particular. And to the Surface team: thanks for the trust in me!